Beta Calibrators can do. 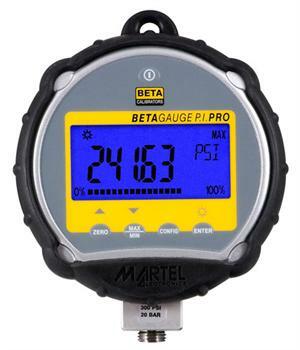 The BetaGauge P. I.
performance, and features set the BetaGauge P. I.
come to expect from Beta Calibrators! 4.375" x 5.0" x 1.50"
permanently incorporated into a process line. the BetaGauge P. I. from damage when dropped. 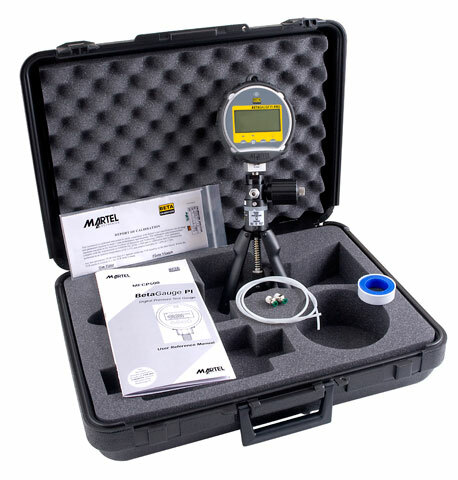 The BetaGauge P. I. is available in a self-contained calibration kit, including a hand pressure pump, and associated fittings. The Martel BetaLOG is the high performance answer for pressure data logging applications. Whether you need to log data on one BetaGauge PI or 100, one easy to use, low cost application handles your entire requirement.